After struggling for years with inconsistent welds produced by an undersized rocker-arm spot welder, this 30-employee precision sheetmetal fabricator now is actively seeking work that involves the resistance-welding process. “Our shop gained a whole new department due to the purchase of two heavy-duty spot welders,” says Greg Johnson, president of LJ Fabricators, Rockford, IL, who manages the family-owned company with his brother Chris, vice president of operations. When it became obvious to the Johnson brothers that LJ’s light-duty 30-KVA rocker-arm spot welder would not handle aluminum, they looked to T. J. 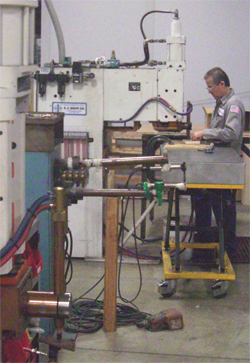 Snow Co., Chattanooga, TN, to provide a remanufactured press-type spot welder. T.J. Snow had converted the machine from its original AC transformer to a state-of-the-art mid-frequency direct-current (MFDC) transformer and control. The high secondary-amperage output of MFDC technology has proven ideal for spot welding aluminum at LJ, and the vertical press-type machine produces very attractive welds, say the Johnsons. And, only two months after installing the new welding machine, the brothers received a call from a customer in the food-service industry that needed to farm out a huge amount of fabricating—75 part numbers requiring stainless-steel spot welding. Soon after that large food-service order landed in the shop, LJ Fabricators purchased a standard T. J. Snow AC press-type spot and projection welder, with a larger diameter air cylinder capable of producing the proper forging force for spot welding of stainless. 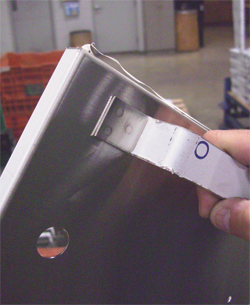 Using the proper settings makes it much easier to get strong and attractive spot welds on stainless steel.